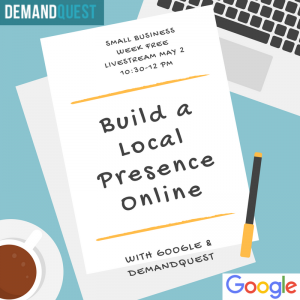 Celebrate National Small Business week by joining us at the DemandQuest Marketing Institute to tune into the Google Livestream where we will show you how to get in front of customers in your area. We’ll discuss consumer trends related to local searches, and share best practices for using Google My Business features, like posts and reviews, to put your best foot forward. Join us on Wednesday, May 2nd from 10:30-12 pm. Register here for free to save your spot today! We’ve been teaching digital marketing for over 10 years and we’re excited to be teaming up with Google to bring a short morning session of great digital marketing insights, free for local businesses. Bring a laptop to work during class or just bring a notebook for notes. We’ll send out resources via email after class. This class will sell out so we will only be able to offer space for up to 4 team members per company/email address. Please respect our free class offer by respecting this policy. Light refreshments will also be provided. Join us May 2, 2018, from 10:30-12 pm in NE Minneapolis. There are billions of local searches happening on Google every day. 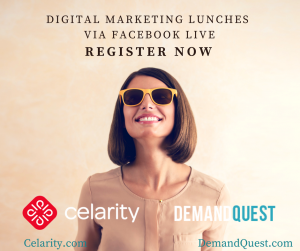 Celebrate National Small Business week by joining us at the DemandQuest Marketing Institute to tune into the Google Livestream where we will show you how to get in front of customers in your area. We’ll discuss consumer trends related to local searches, and share best practices for using Google My Business features, like posts and reviews, to put your best foot forward. We’ll have a Q&A with our resident Google expert and instructor Ted Kozlowski. Join us on Wednesday, May 2nd from 10:30-12 pm at our school in NE Minneapolis. As a Google Premier Partner, we’ve been teaching digital marketing for over 10 years and we’re excited to be teaming up with Google to bring a short morning session of great digital marketing insights, free for local businesses. 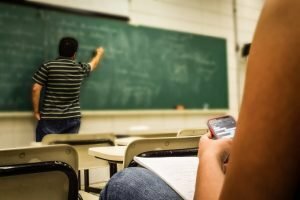 Bring a laptop to work during class or just bring a notebook for notes. We’ll send out resources via email after class. This class will sell out so we will only be able to offer space for up to 4 team members per company/email address. Please respect our free class offer by respecting this policy. Light refreshments will also be provided. 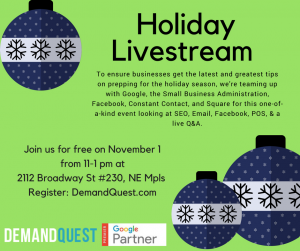 To ensure small businesses get the latest and greatest tips on prepping for the holiday season, we’re teaming up with Google, the Small Business Administration, Facebook, Constant Contact, and Square for this one-of-a-kind event looking at SEO, Email, Facebook, POS, & a live Q&A. It’s a free 2-hour event with light refreshments and a look at how you can reach more customers this holiday season! Please note that this is not part of our high-level digital marketing training curriculum where we go in-depth into AdWords, Analytics, etc. This is a basic level introduction to digital marketing for small businesses only! Thank you. 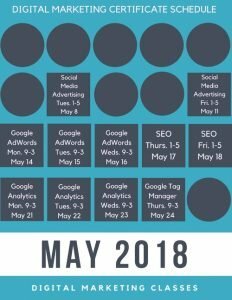 We’ve been teaching digital marketing for over 10 years and we’re excited to be teaming up with Google to you hours of great digital marketing workshops free for local businesses. Bring a laptop to work during class or just bring a notebook for notes. We’ll send out resources via email after class. This class will fill up so we will only be able to offer space for up to 3 team members per company. Please respect our gracious free class offer by respecting this policy. Light refreshments will also be provided.